TALKING POINT - Have Real Madrid now given up on La Liga? Real Madrid had ground to make up on the pace-setters at the top of La Liga following their participation in the Club World Cup. However, they have dropped points away to Villarreal, and now at home to Real Sociedad, before Barcelona have even resumed their league campaign after the winter break. There was an apathy to Real Madrid’s game, and the atmosphere inside the Santiago Bernabeu… so have they given up on La Liga for another season? On another day, this could have been a thumping for Real Madrid. The hosts saw more of the ball, in terms of share of the possession, but Real Sociedad carved open the European champions almost at will. Jose posed the greatest threat, scoring from the penalty spot against his former side and generally providing Real Sociedad with an outlet, although Merino, Januzaj and Mikel Oyarzabal also impressed. Real Madrid - Courtois, Carvajal, Varane, Ramos, Marcelo, Modric, Casemiro, Kroos, Vazquez, Vinicius, Benzema. Subs - Isco, Reguilon, Ceballos. Real Sociedad - Rulli, Elustondo, Moreno, Zurutuza, Munoz, Llorente, Illarramendi, Merino, Oyarzabal, Januzaj, Jose. Subs - Pardo, Zaldua. 2’ PENALTY KICK TO REAL SOCIEDAD! Wow! What a start! The away side are awarded a spot kick after just 80 seconds, with Casemiro clipping Merino in the box. 3’ GOAL! Real Madrid 0-1 Real Sociedad: Real Sociedad take the lead at the Santiago Bernabeu! Jose steps up to the 12-yard mark and slams a finish down the middle of the goal, with Courtois diving the wrong way. What a start to this match. The pressure is really on Real now! 8’ How did he miss? That should have been an equaliser for Real Madrid. Vazquez got the cross into the box, Vinicius unsettled the defence, but Benzema fires wide at the far post from about eight yards out. 44’ Off the post! Vazquez was definitely trying to tease a cross into the box, it wasn't a shot, but the ball comes back off the inside of the post. Rulli was beaten! Unlucky for Real Madrid. 52’ Januzaj goes so close! Inches away from being a second goal for Real Sociedad. Januzaj dribbles past two Real Madrid players, cuts inside and curls a left-footed strike towards goal. It flashes just wide of the post. 62’ SENT OFF! Real Madrid have been reduced to 10 men. 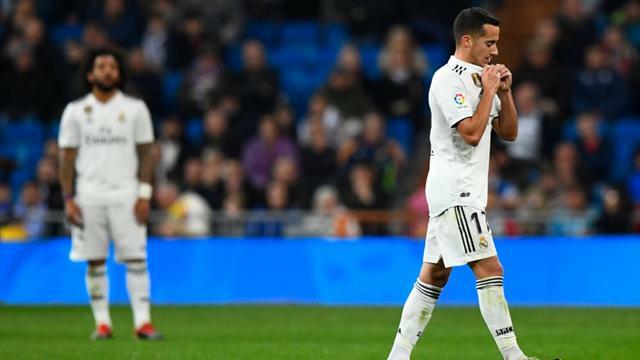 Vazquez has been shown a second yellow card for a late tackle on Merino. What a situation Solari's side find themselves in now. 65’ Big penalty claim! Isco scooped a pass through for Vinicius to chase. The Brazilian won the race and goes down as Rulli stretches for the ball, but the referee says no penalty kick! 83’ GOAL! Real Madrid 0-2 Real Sociedad: And that should be that. Real Madrid were caught short at the back, with Januzaj finding the unmarked Pardo inside the box. The substitute makes no mistake in guiding his header past Courtois and into the back of the net.